Finalists for the 2016 Oxford Samuel Beckett Theatre Trust Award, DH Ensemble, and their lead artists are here to share their top tips for making theatre as a bilingual ensemble. From the practicalities, to the process to the creativity, they walk you through all you need to make it happen. 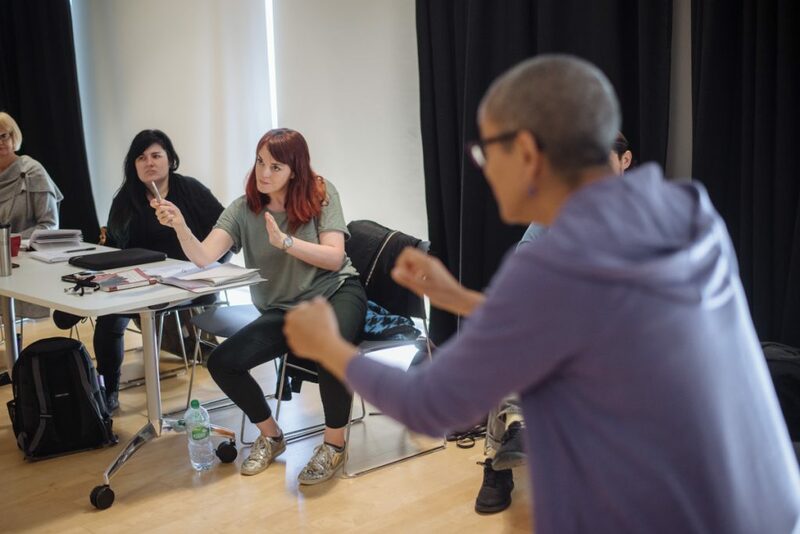 The DH Ensemble is a theatre company led by Deaf and hearing artists who use English and British Sign Language (BSL) in the rehearsal process and in our performances. We work as an ensemble using improvisation and play as an essential part of our process, even when working from a script. As well as spoken English and BSL, our work often incorporates creative captions, video projection, movement and soundscapes. 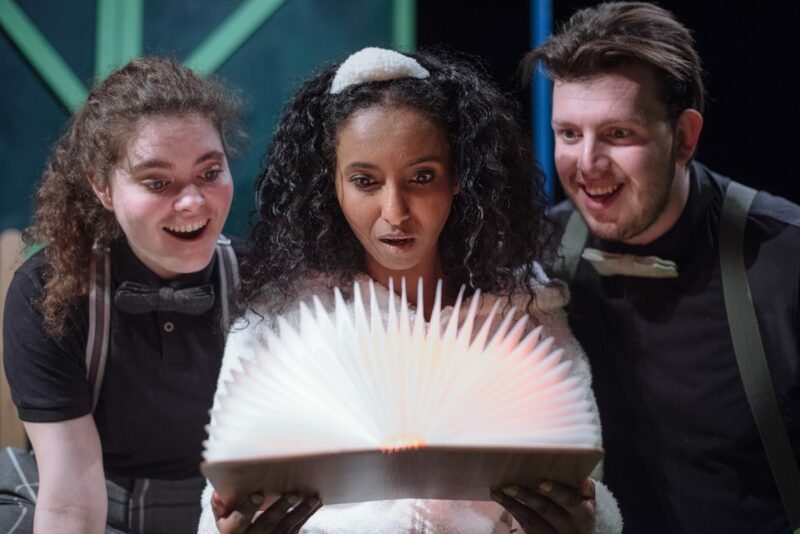 We are currently touring a bilingual adaptation of a children’s book Mathilda and the Orange Balloon and developing a bilingual version of Macbeth called Fair is Foul (recently supported by National Theatre Studio). Mathilda and the Orange Balloon. Photo credit: David Monteith-Hodge. Equality: Make sure the two languages enhance and support each other – one language shouldn’t be dominant. It is essential to discover and explore the marriage of the two languages and how they relate to one another. Likewise, all the performers on stage are equally as important – nobody is ‘interpreting’ for anybody else unless this is a deliberate character choice within the piece. Analysis: Explore each spoken word/sign and question why it is there. Is it necessary? Is this the best choice of language to reflect character and tell the story? Question everything: Why are these particular languages important for this particular piece? What does it bring to the work? Find the artistic, character-driven and aesthetic significance of the use of language rather than simply looking at it from an access point of view. The actors must discover and own the language within the piece. Patience: There’s often a translation process that has to happen and you need to give it time and space. There will be moments when the two languages clash and it’s about allowing that to happen and seeing where that takes you. Process: Everyone works differently when it comes to translation, discovering character and relationships or script analysis. This can be heightened in a bilingual room particularly when a translation process is essential. Allow the time and space for each individual to work in their own way and digest the process as a whole whilst also learning from each other and working as a team. DH Ensemble: Director, Jennifer K. Bates, in rehearsal for Fair is Foul. The people in the room: Each artist needs to have an understanding of both languages to start from a place of common ground. This doesn’t necessarily mean a fluency or even a working knowledge but it means a respect and understanding for how each language works and a willingness to learn. It’s important to have a shared base of knowledge to bring to the table as a jumping off point and this needs to be given to new artists before they join the process. Everyone in the room is important and each opinion is valued, from the director to the lighting designer to the sign language interpreters – everyone’s individual strengths and expertise are respected. Visual tools: Communicate in new ways and think about the use of projection, creative captioning and lighting in ways that marry with sound and physical language. Ask what other tools could be used as an alternative to audio. Practicalities: Consider health and safety, last minute announcements, gatherings, meetings, Q&As – have these been thought through to support and include a deaf person? What physical materials can be given if there’s no other option? Pre-prepare these things, don’t add them as an afterthought. Play with sound: Think about how sound can reach an audience as a physical sensation – vibrations, infrasonic tones, the use of new technologies. Be creative: There’s an enormous wealth of exciting possibilities open to you when you choose to work in two or more languages. Enjoy! Tips by The DH Ensemble’s lead artists Jennifer K. Bates, Stephen Collins, Erin Siobhan Hutching and Sophie Stone. Touchbase Pears Birmingham 25 May. Learn more about Fair is Foul.